Prediction may be a mug’s game but it’s still great fun. And, when it comes to Britain’s vote on Brexit, it’s not even as if we have nothing to go on. There have already been loads of opinion polls on the question. There’s also one heck of a historical precedent – the European referendum of 1975. 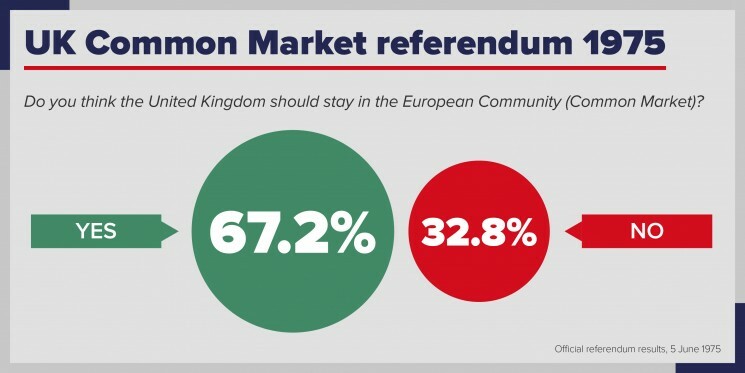 And then there’s what we know about referendums more generally. Stir in an added ingredient – the Conservative Party’s latent leadership contest – and we can come up with what passes for an educated guess about who’s going to win: ‘in’ or ‘out’. For UK pollsters, 2015 was something of an annus horribilis: after all, not a single one of them got the result of May’s general election right. But to discredit what they do on the basis of one admittedly awful call would be ridiculous. True, we need to be careful. Surveys provide different results depending on which company you go to for your polling, and they can only ever provide a snapshot, not a prediction. 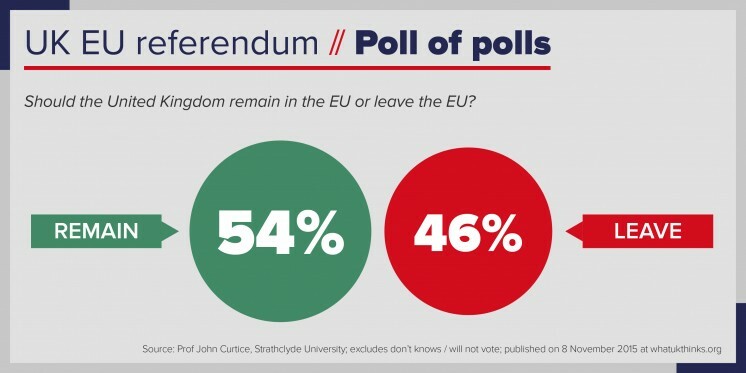 So while it may be the case (to quote from John Curtice’s poll of polls) that some 45% of people would currently vote to stay in, some 39% would vote to leave, and some 16% don’t know, this clearly has the potential to change. Indeed one thing we know from polling on this issue is that public opinion on it is not only very divided but also very volatile. But there are other things emerging from the polling that might potentially help us guess at the outcome. 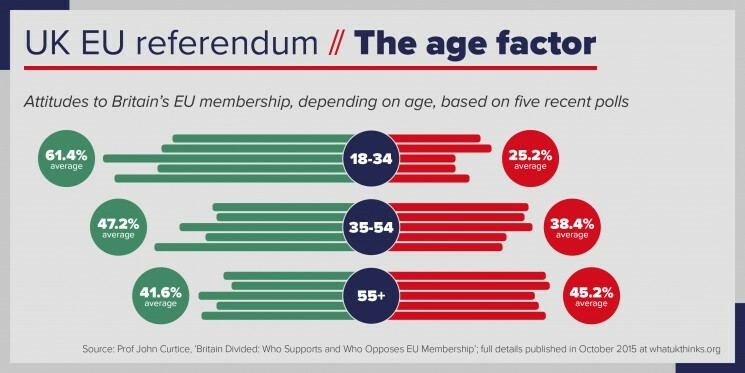 Even a cursory glance at the demographics reveals the tendency of different groups to display very different attitudes to the EU. Age has a big impact. Nearly two-thirds of British 18-24 year olds say, at least at the moment, that they’ll vote to stay, whereas half of those over 65 claim they want to leave. Social class matters too: a majority of those in non-manual occupations reckon they will vote to remain, which is far from being the case among those in manual occupations or no occupation at all. All this matters because differential turnout could be crucial in the referendum, even if, ironically, it might make predicting the outcome more difficult. Well-heeled, well-educated people tend to vote more than those who aren’t so lucky, which should be good for the in campaign. On the other hand, the old vote in far greater numbers than the young (in general elections anyway), which should be good for ‘leave’. It could be that these two trends could cancel each other out but, whatever, it will be worth paying very close attention to how big the turnout looks like being. If the proportion of those going to the polls comes anywhere near the 64.5% it reached in 1975, most psephologists would be surprised. But there are still plenty of similarities between now and then. Like Harold Wilson, David Cameron is a sceptical prime minister sitting on a narrow Commons majority, presiding over a badly-divided party, carrying out a renegotiation that his opponents routinely (and probably rightly) dismiss as cosmetic. As in 1975, many of those opponents are fairly easily labelled as living on the radical populist fringe of politics. And, as in 1975, the majority of British business – seen by most voters as very much in the mainstream by comparison – is ranged against them. But it is the differences between now and then that are, perhaps, most striking than the similarities. Cameron’s renegotiation seems to have been going on, if not forever, than at least since his Bloomberg speech in 2013. Not for no reason, then, has his government’s agonisingly gradual revelation of what it actually wants from other member states been labelled by one waggish columnist as ‘the world’s longest striptease’. Sadly, judging at least from the negative press and party reaction to Cameron’s ‘Dear Donald letter’ of November 10, it looks as if the end result could be even more disappointing than those performances usually are in real life. Mr Wilson concluded the 1974/5 renegotiation relative swiftly and relatively successfully. Even if there is a degree of stage management in the helpfully wary reaction from other European governments, things look they will be more than a touch trickier for Mr Cameron. Wilson also had another advantage over Cameron that’s worth noting. The latter operates in an environment where to be on the populist radical fringe of politics is nowhere near as much a problem as it was back in the mid-seventies. Sure, Nigel Farage puts off a lot of moderate, centrist voters – and therefore presents something of a double-edged sword for the out campaign. But in an era where sticking two fingers up at the despised and disconnected ‘political class’ is deemed perfectly legitimate, even perhaps as a public service, Ukip’s leader is arguably nowhere near as poisonous to the anti-European cause as Enoch Powell or, on the other side of the ideological fence, Tony Benn were to its 1970s equivalent. And then there is business. In 1975 its support for staying in was little short of overwhelming: there was barely a company or corporate pressure group which believed there was any alternative for a country widely seen as ‘the sick man of Europe’. Things are very different these days – and not just because, compared to the rest of the continent anyway, the British economy is doing very nicely thank you. Yes, it is probably true that most businesses would on balance prefer to be in than out, but many of them claim their support is contingent on the deal achieved by Cameron and some, especially in the SME sector and the City of London, believe that Britain’s future (and of course their own best interests) would be better served by escaping what they see as the bossy regulators of Brussels – especially if the EU increasingly marches to the tune of its Eurozone core. This means that the message to the 80% of the population who work in the private sector will be a much more mixed one than it was in the mid-seventies. It also means that the funding gap between the in and out campaigns will be nothing like as big as it was back then – if it exists at all. In 1975, the in campaign amassed the equivalent in today’s money of around £15 million, while its opponents could only call on the equivalent of just 1 million. No one is saying that money can buy a result one way or another, but doesn’t half help. Business people, of course, are not the only bunch who will be trying to persuade people to vote one way or another. The parties will be trying their hardest. Or will they? Labour under Wilson was, like today’s Tories, split from top to bottom on Europe but he could rely on his Tory opposition (led by Margaret Thatcher before she got religion on the issue) to back staying in the EEC ‘heart and soul’. Can the same really be said of Jeremy Corbyn’s Labour Party? Given the extent to which the (admittedly dwindling) band of loyal partisans take their cue from ‘their’ party’s leadership then Corbyn’s rather lukewarm support for the EU may give a fair few Labour voters – particularly those who see the EU as a malign agent of neoliberalism which has ganged up on their Greek heroes in Syriza – the ‘permission’ they feel they need to vote ‘out’ rather than ‘in’. The other pack of persuaders are the press. And when it comes to them, there are huge differences between 1975 and now. Back then, only the Spectator and the communist daily, the Morning Star, backed Brexit. Nowadays, the only sure-fire supporters of stay are theGuardian, the Independent, the FT and (so far anyway) the Mirror – who represent nowhere near as many readers as the Mail, the Telegraph and the Sun. Of course, papers these days boast much smaller circulations and therefore potentially wield less influence, so this turnaround shouldn’t be overdone. Television is more important, just as it was in 1975. On the other hand, forty years ago there was no such thing as digital and social media, meaning it was far harder than it is nowadays for those who had basically made up their minds to then insulate themselves from alternative points of view that might – just possibly – shake their faith. So, while it is tempting to stress that perhaps around a fifth of voters currently and genuinely don’t know where they stand on Brexit, there are a whole lot more people around now than there were in the 1970s who are immune to the charms of campaigners – and on balance there are probably more phobes than philes in the ranks of the unreachable. The fact that campaigns actually seem to matter is one of the things that the research on referendums tells us. It also tells us that voters tend to have a bias towards the status quo, particularly if change involves risks that can be made to seem unnecessary or costs that can be made personally tangible – all of which should heavily favour the in campaign, as long, that is, as it doesn’t so overdo the fear factor that voters end up feeling bounced or blackmailed. Research also tells us that, while referendums can be highly educative (something that may favour ‘in’ because people who are more knowledgeable about the EU tend to be more supportive), they can sometimes see voters answering a different question to the one on the ballot paper. In the past, for instance, we’ve seen referendums on EU treaties revolve around abortion and around Polish plumbers – and of course around the unpopularity of governments in mid-term. Given the importance most voters (and many in the media) attach to the issue, and given the way both Ukip and the Tories have successfully conflated it with Britain’s EU membership, immigration seems bound to play a huge part in the upcoming referendum. Indeed, the success of the out campaign may well hinge upon the extent to which it can, without tipping over into the toxicity that might alienate many moderate voters, make the referendum a plebiscite on how many foreigners this country can afford to take in. The final factor that we can’t ignore is the temptation that playing a big part in the out campaign presents to some of those hoping to prize George Osborne’s well-manicured fingers from the door handle of Ten Downing Street. It seems a pretty fair bet that a vote to stay in the EU will be quickly followed by (presuming for a moment that it isn’t preceded by) a clear-out of those Cabinet members whom Cameron and Osborne have been putting up with, as opposed to getting on with, for some time. The Home Secretary, Theresa May, has good reason to fear that her name is number one on their hit-list. Consequently, she may well conclude that her one and only chance of a decent crack at the leadership is (a) to jump before she is pushed, then (b) help front an ultimately successful out campaign and (c) put herself forward in the event (not, note the certainty) that Cameron and Osborne resign in the wake of defeat in the referendum. Such a move would probably be doomed to failure, but that doesn’t mean it won’t happen – or that it wouldn’t persuade more Tory voters than the government would like to plump for in rather than ‘out’. The real danger, though, is – as perhaps it’s always been – Boris. Were he to pursue a similar course, believing that, unless he does so, Osborne will cruise to victory on the back of Britain voting to stay in the EU and giving him the credit for continued economy recovery, then the man who is still the country’s favourite politician might be persuaded to throw proverbial caution to the winds. He is actually less likely to do this than is frequently forecast – London’s Mayor is more risk-averse (and more willing to bide his time) than many realise. But if he does press the Brexit button, all bets could be off. Where, then, does this leave us in the mug’s game to end all mug’s games we began with – predicting the result of the referendum itself? Gun-to-head, my best guess is as follows: while there is (ehem) a ‘non-trivial’ risk that the British will vote to leave, they will ultimately vote – albeit by a much narrower margin than they did in 1975 – to remain in the EU, an arrangement to which, in the end, a majority cannot see any clear or pressing alternative. Of one thing, however, we can far more certain: contrary to what many of those who will welcome that result are hoping, it will fail utterly to settle the Europe question ‘once and for all’. As to whether, in a democracy, that kind of never-ending uncertainty is necessarily a bad thing, who knows? This entry was posted in Uncategorized and tagged Boris Johnson, Brexit, David Cameron, EU referendum. Bookmark the permalink.